Martin Truex Jr’s hatred for fuel mileage races may have drifted due to his win in Sunday’s I Love New York 355 at Watkins Glen International. Truex began saving fuel early, letting Brad Keselowski pass him with less than 15 laps to go, in hopes he would have enough to make it to the end for a chance at the second road course victory of his MENCS career. The driver of the No. 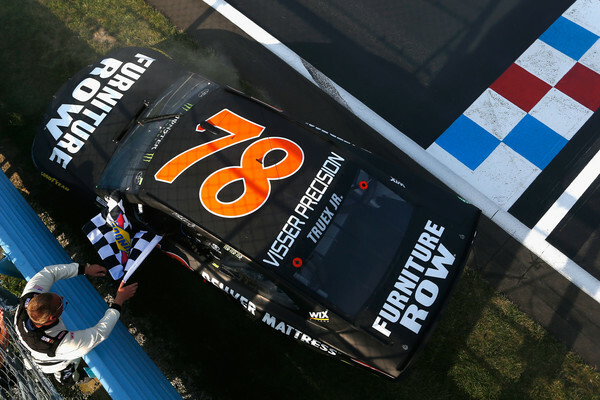 78 Furniture Row Racing Toyota did. The strategy paid off for Truex because both Brad Keselowski and Ryan Blaney had to pit for a splash of fuel. Truex regained the lead with three laps remaining and held off a charging Matt Kenseth to earn his fourth win in 2017. Kenseth finished second to earn his sixth top-5 finish this season. The Joe Gibbs Racing driver is still looking for a win to secure his ticket to the playoffs with four races remaining in the regular season. Dale Earnhardt Jr. finished last after an early exit due to a valve train issue. Earnhardt took his Chevrolet to the garage after falling off pace at the end of the first stage. Kyle Busch battled back from early pit stop problems to finish inside the top-10. Busch was forced to pit a second time under caution at the end of Stage 1 for a loose wheel. Busch restarted in the back of the field, but made his way back inside the top-10 before making contact with Keselowski within the bus stop. Busch finished seventh while Keselowski finished in the 15th position. The Monster Energy NASCAR Cup Series heads to Michigan on August 13th for the Pure Michigan 400 at 3 p.m ET on NBC Sports.